How should local communities prepare to deal with a potential shock such as flooding, drought or an economic crisis? Which resources – internal and external – are at risk, and which can be used to overcome those risks? And does this require mechanisms of coping, retreating, adapting, or something new? This column describes an interactive toolkit tested in Thailand that can help to develop a strategy for managing a crisis. 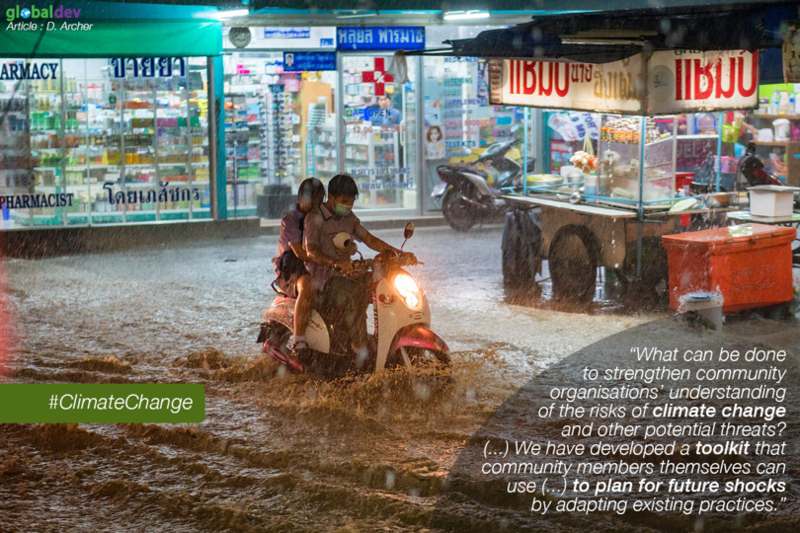 What can be done to strengthen community organisations’ understanding of the risks of climate change and other potential threats – and the actions that can be taken to reduce their impact? With funding from the UK Government’s Newton Fund, the collaborative PEACE-BMR project of the International Institute for Environment and Development (IIED) and the Urban Futures Research Unit of the Faculty of Architecture and Planning at Thammasat University in Bangkok, Thailand, has been addressing this question. The focus includes use of household and community assets, and external resources that the community members regularly access, such as school grounds or local markets. In addition to the usual household surveys, community focus group discussions and multi-stakeholder workshops, we have also developed a toolkit that community members themselves can use – both as a mechanism for identifying collective resources and planning for future shocks by adapting existing practices. Building on past collaborations, we engaged community architects from Openspace to create an interactive, hands-on toolkit, which we have just piloted in three communities in Thailand. The Urban Futures Thammasat University team had previously worked with Openspace to develop an urban resilience game in the Coastal Cities at Risk project. This had a city-level focus, with players representing mayors in the Bangkok Metropolitan Region, holding a budget and an investment portfolio, and facing the threat of disasters wiping out their investments. This game targeted urban practitioners to consider the potential impacts of climate change on the city’s infrastructure investments. This time we’ve designed an interactive community-level toolkit that focuses on seven types of resources used by community residents: from water, food, shelter and people, economic resources, community assets, and new resources made from old (for example, by recycling materials). Known as ‘Kin dee you dee’ (live well, eat well), the tool starts with a discussion of key concepts, to ensure that everyone knows what is meant by ‘risks’, ‘resources’ and ‘climate change’, among others. This is done by fitting puzzle word and definition cards. There is then a mapping exercise: looking at which resources are used and how in a typical day and week. The resources identified are then pinned to a community map, to see where such assets are clustered, which are internal (playgrounds, shops, canals) and external (wet markets, hospitals) to the community, and which areas of the community may be overlooked. This is also an opportunity to discuss problematic resources, such as canals polluted with sewage. Then comes the hypothetical shock, such as flooding, drought or an economic crisis. Which resources, internal and external, are at risk? Which can be used to overcome the risks? Does this require mechanisms of coping, retreating, adapting or something new? The discussion can lead to identifying a strategy to manage the crisis. The participants will define the outcome of the toolkit: is the community leader there? What is the age of the participants? Is there a gender balance? The participants will depend on the timing of the session – a weekend sitting will attract more diverse players than mid-week daytime, when many people are at work. In one pilot community, we had already had conversations with the community leader, who had a very clearly defined list of key problems facing the community. When we piloted the toolkit with other residents, we were curious to know whether the same challenges would be identified. While the problems may not have been listed in the same order, we found that they largely mapped onto those we’d discussed with the community leader. In another pilot, the participants included four teenagers. They initially required a lot of coaxing to participate fully. Teenage participants also change the possible outcomes: they are not heads of households and therefore may not have the same understanding of how to manage household and community resources and the possible effects of a crisis. Having teenagers play their own round of the game could reveal some very different community priorities and strategies – such as the use of mobile technologies. Finally, this particular tool is designed for those who are fairly familiar with environmental issues. In the first ‘definitions’ puzzle, many of the words require complicated terminology. This also means that participants should be confident readers, though good facilitation can help with clarifying meanings. The tool was designed to be quite visual, with pictograms, simple cards, flags and maps, to make it easy to use. While the piloting has revealed some necessary modifications, the process has enabled an interactive discussion of community resources and problems, which can be resolved through community mechanisms and which will require external support. The process, with its visual tools and interactivity, raises issues that may not otherwise be uncovered through a simple discussion, and presents a more physical understanding of the situation. Diane Archer is a Senior Researcher in the Human Settlements Group at the International Institute for Environment and Development (IIED). She specialises in urban community-led development, urban resilience and urban humanitarian response.